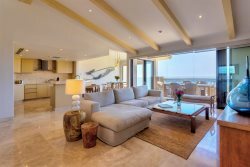 Villa Lands End, one of Pedregal’s most desired locations has been renewed and refined, transformed into the most spectacular contemporary villa on a soaring cliff 260 feet above the Pacific Ocean! At Villa Lands End you will be delighted with stunning 200-degree views from Lands End to Solmar Beach to the vast Pacific and picturesque cliffs further up the coast. You have dazzling ocean views, which are perfect for whale watching, enjoying the sunset or simply calming your soul. The sight and sound of falling water accompanies you as you walk the entry path to the main entrance. As you near the entry, you’ll see on your left a serene tranquility garden, the spacious interior on the main level offers a gourmet kitchen with a wine refrigerator, contemporary cabinets and counters, a dining area with seating for 14, a great room with fireplace and a built-in 75-inch ultra high definition TV. Additional seating around the kitchen island lends a convivial air to any entertaining situation. Step outside to the patio right off the dining area and drink in the Pacific view, or see the action on the pool level, one floor below. The pool level itself is designed for the ultimate in al fresco living. Cool off in the beautiful infinity pool, relax in the hot tub or on one of the many chaise lounges on the pool deck. Immediately adjacent to the pool is a recreation room with a bar, full kitchen, bathroom, lounge chairs, pool and game table and television. Fire up the built-in gas barbecue, turn on the outdoor fire pits and enjoy the panoramic view from your covered outdoor dining area. One of the seven ensuite bedrooms is a luxurious 1,565 square foot master suite, with its own private balcony and hot tub. All of the bedrooms offer private baths, high-definition televisions and spectacular ocean views, and five of the seven suites have balconies with outdoor seating.